Component 1 ‘W’: What can I WIPE OUT from my current diet and lifestyle that is sabotaging my immune system and my thyroid? Component 2 ‘E’: What can I EXCHANGE or ADD to my life to boost the immune system, detox the body, and help the thyroid? Component 3 ‘L’: How can I find a LIFE BALANCE in what I’m doing so I don’t go crazy, and instead really learn to enjoy my new life? Component 4 ‘L’: Are you truly LOVING yourself enough to learn, invest, and have patience in your journey? SUGAR FLUCTUATIONS - This means sugar cravings, hypoglycemia or insulin resistance, and normalizing these first is key to restoring thyroid health. Without fixing your sugar issues, your thyroid will never improve. This is because the pancreas is responsible for sugar metabolism; and similar to the thyroid, the pancreas is also part of the endocrine system. FOOD INTOLERANCES - Have you seen “gluten-free,” “dairy-free,” etc. popping up at the health stores lately? This is because many people are trying to rid their diets of the big five (gluten, dairy, corn, eggs and soy) in search of significant changes to their health. You can also have a food intolerance IgG test done, which is different from an allergy test, but they are still far from accurate. Gluten is an infamous food if you have a thyroid condition; and eliminating it is pivotal in restoring healthy functions. However, you often need to cut out more than just gluten. LEAKY GUT (aka IRRITABLE AND INFLAMED DIGESTIVE TRACT) - Most thyroid conditions are autoimmune diseases. There are multitudes of lymphocytes and other immune system cells in the gut, which protect the body from viruses, bacteria, and other invaders. This is why most people with thyroid conditions also experience frequent bloating, gas, constipation or diarrhea. A diet change will help your gut tremendously. “All diseases begin in the gut,” said Hippocrates, the father of Western medicine, and I’m not sure why this is not taught in medical school today. Reduction and total elimination of food intolerances is the first and most important step in restoring the health of the gut. NUTRITIONALLY DENSE FOOD - Food that is nutritionally dense and provides all the key macro- and micronutrients in good ratios needs to be added in place of sugar-rich monstrosities. PROTEINS and FATS - These are the building blocks of both your digestive track and your hormones. We are fat-o-phobic in America, and low-fat diets are one of the worst things we invented. Europeans and Asians traditionally sustain fat-rich diets and still enjoy much better health than we do. Choose foods rich in good fats, such as avocados, walnuts, coconut oil, and coconut butter. Animal fats are best for restoring a troubled digestive system; ghee (clarified butter), real butter, chicken and beef fat are essential, but need to be rendered, not in fried or processed form, for maximum health benefits. PROBIOTICS (50 billion CFU per serving) are key in restoring your digestive tract. Everyone has bacteria in their digestive tract that is essential to the function of the human body. A healthy adult has about 1.5 – 2 kg of bacteria in their gut, both good and bad. HERBS, SUPPLEMENTS and VITAMINS - Get these from real, whole food whenever possible, as too many people over-medicate with synthetic versions and feel worse later. Also, most people are Vit D deficient. Taking Vit D in 2,000-5,000 units is safe and healthful, as Vit D is actually a hormone, connected to the thyroid. Calcium is fundamental, but needs to be taken with magnesium, vitamin D and K2 for full absorption. Fat needs to be present for the vitamins to be absorbed. SIMPLE MEDITATION, BREATHING and VISUALIZATION techniques can help manage stress and emotions. I cannot emphasize enough how important this is, especially for people with hyperthyroidism. We underestimate what stress and emotions do to us. Each are-up of anger, along with feelings of guilt, fear, hostility, or jealousy, re up the adrenals, which then release cortisol. This hormone has a detrimental impact on the thyroid. MOVEMENT PLAN. Many of us may think that working out harder would be best to help our sluggish thyroid. But that’s actually not the case. If hormones and thyroid levels are totally off, you need to give your body a break and concentrate more on low impact exercises like walking, yoga, swimming, Pilates, or light cycling. However, as levels normalize, any and all types of exercises are ok BUT, it needs to be 30 minutes or less. Weight training will build more muscle to increase a sluggish metabolism. No one diet or lifestyle plan works for everybody, as each person has a unique way of healing. There is a saying: “One person’s food is another’s poison.” It’s always worth remembering that just because one diet worked for one person, it does not mean it will work for you, too. One person could have healed their thyroid by just changing their water filters and eliminating fluoride, while another needs to implement have major diet and lifestyle changes to start feeling just a little better. Let’s respect our differences. Love yourself enough to take the time to learn what’s best for your body. Invest in the necessary resources. Most importantly, have patience because as we evolve through various life events, our bodies will change too. So, have the mindset that you are on lifelong journey of healing. There are a few steps you can take. First, you can take this guide and create a plan yourself. However, as easy as it is do, it’s also easy NOT to do. So rather than trying to do things by yourself, I highly recommend that you join other women and exploring natural thyroid solutions through the Live Thyroid Well program, where you will get everything you need to begin a successful journey to better thyroid health. This program gives you everything from a nutrition plan to Ayurvedic techniques to exercise recommendations. It even has the best essential oil suggestions for your thyroid health. This program addresses ALL 4 components of The W.E.L.L. Method in an easy to learn, implement, and supportive environment. This is your access to lifelong resources to natural solutions and health, but no matter what path you choose to take, I’m honored you’ve chosen me to help you in your journey. 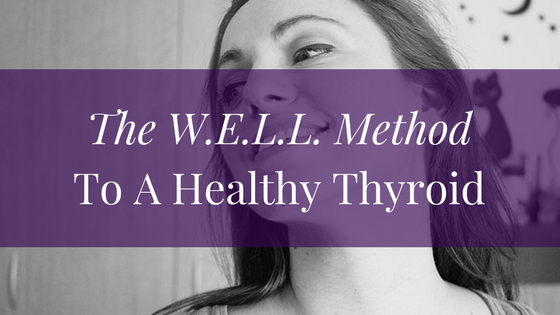 Learn more about The Live Thyroid Well Program.